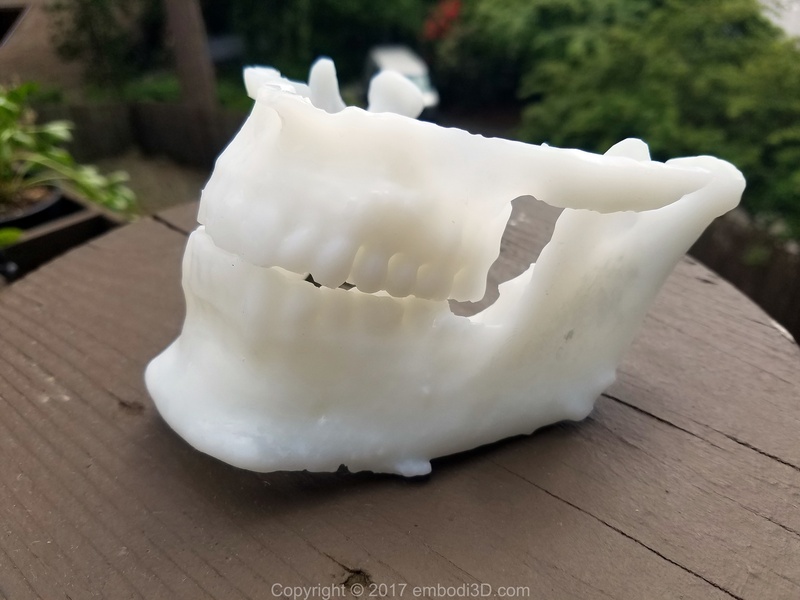 In this tutorial we will learn how to easily create a 3D printable dental, orthodontic, or maxillofacial bone model quickly and easily using the free democratiz3D® file conversion service on the embodi3D.com website. Creating the 3D printable dental model takes about 10 minutes and requires no prior experience or specialized knowledge. Dental 3D printing is one of the many uses for democratiz3D. You can 3D print teeth, braces, dental implants and so much more. 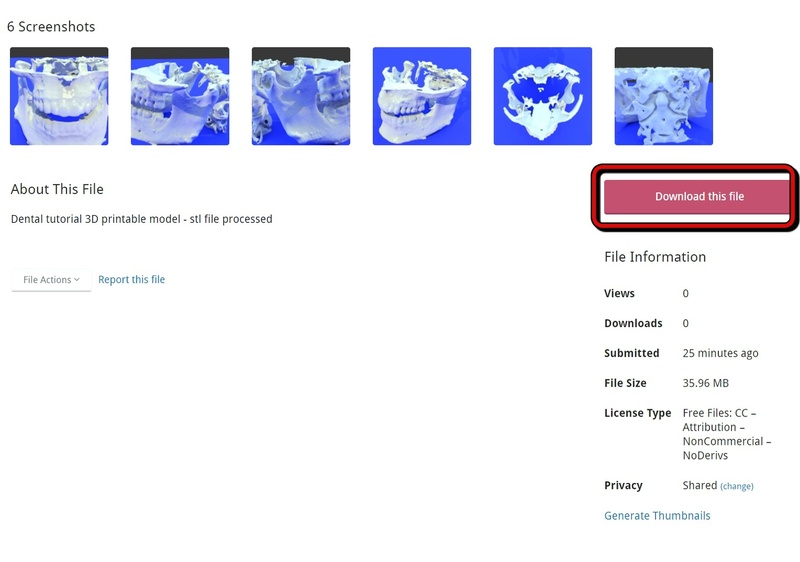 Step 1: Download the CT scan file for dental 3D printing. Go to the navigation bar on the embodi3D.com website and click on the Download menu. This is shown in Figure 1. This will take you to the download section of the website, which has a very large and extensive library of 3D printable anatomy files and source medical scan files. Look for the category along the right side of the page that says Medical Scan Files. Click on the section within that that says Dental, Orthodontic, Maxillofacial, as shown in Figure 2. This section contains anonymized CT scans of the teeth and face. Many of the scans in this section are perfect for 3D printing dental models. For this tutorial we will use the file openbiteupdated by member gcross, although you can use any source CT scan. This particular scan is a good one to choose because the patient does not have metallic fillings which can create streak artifact which can lower the quality of the model. Click on the link below to go to the file download page. 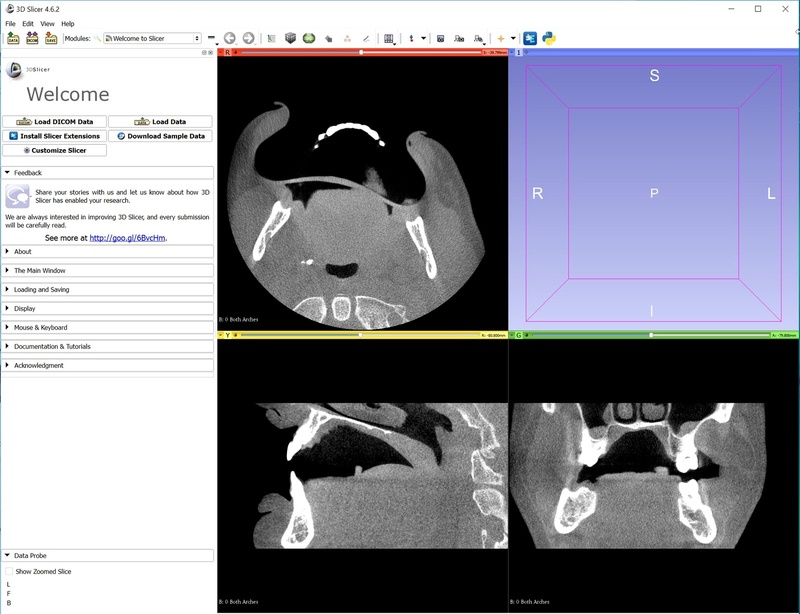 Step 2: Preview the Dental CT scan file. Once you've downloaded the file you can inspect the CT scan using 3D Slicer. If you don't know about 3D Slicer, it is a free open source medical image viewing software package that can be downloaded from slicer.org. Once you have installed and opened Slicer, you can drag-and-drop the downloaded NRRD file onto the slicer window and it will open for you to view. You can see as shown in Figure 3 that the file appears to be quite good, without any dental fillings that cause streak artifact. Figure 3: Viewing the dental CT scan in Slicer. 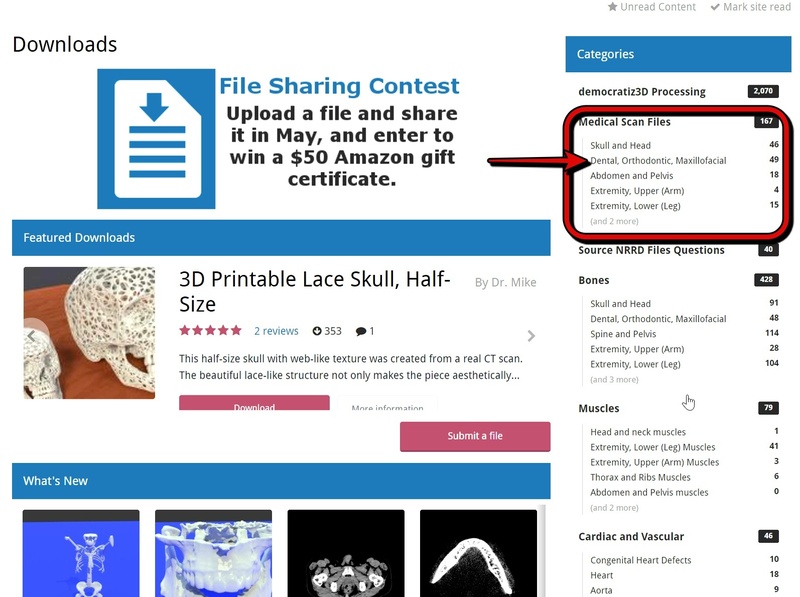 Step 3: Upload your dental CT scan NRRD file to the democratiz3D online service. Now that we are happy with our NRRD source file, we can upload it to the democratiz3D service for conversion into a 3D printable STL file. 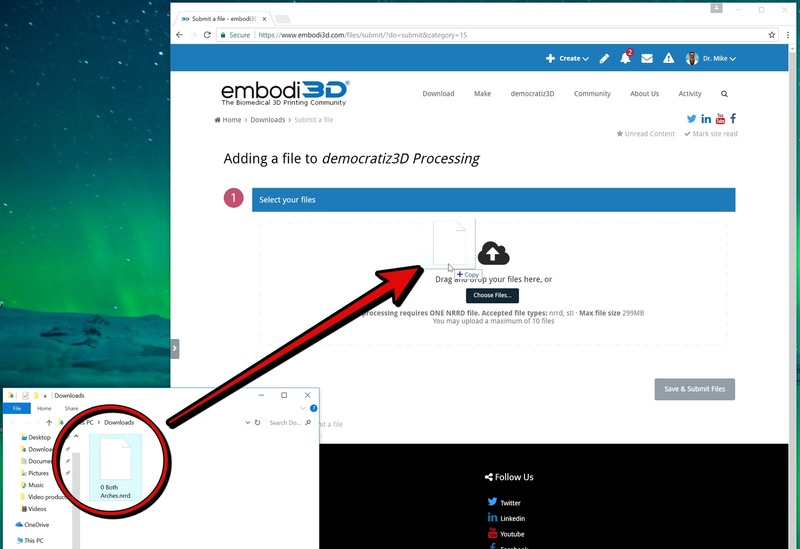 On the embodi3D website click on the democratiz3D navigation menu and Launch App, as shown in Figure 4. Figure 4: Launching the democratiz3D service. Once the online application opens, you will be asked to drag-and-drop your file onto the webpage. Go ahead and do this. Make sure that the file you are adding is an NRRD file and corresponds to a dental CT scan. An MRI will not work. This is shown in Figure 5. 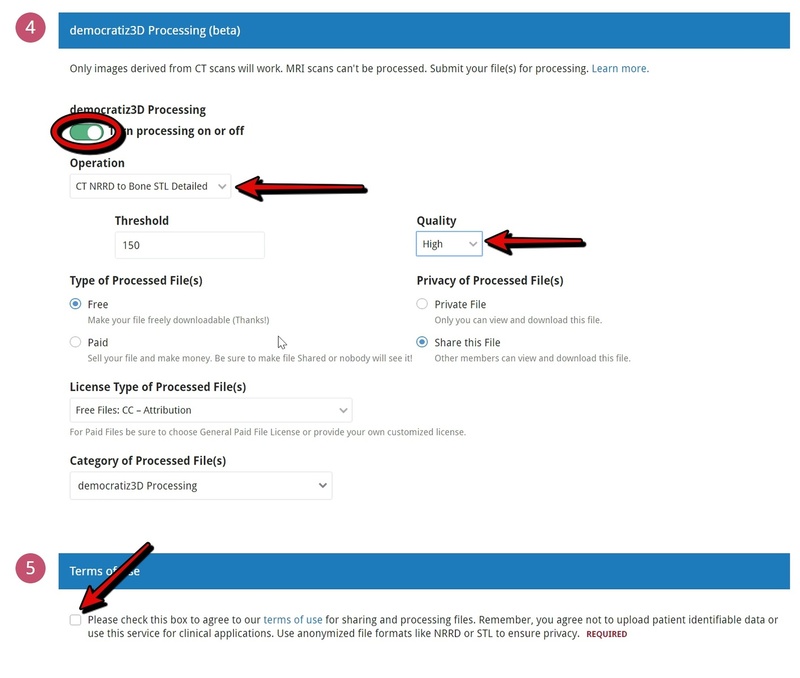 Figure 5: Dragging and dropping the CT scan NRRD file onto the democratiz3D application page. While the file is uploading you can begin to fill out some of the required form fields. There are two main sections to the form. The section labeled 3 pertains to the file currently being uploaded, the NRRD file. Section 4 pertains to the generated STL file that democratiz3D will create. 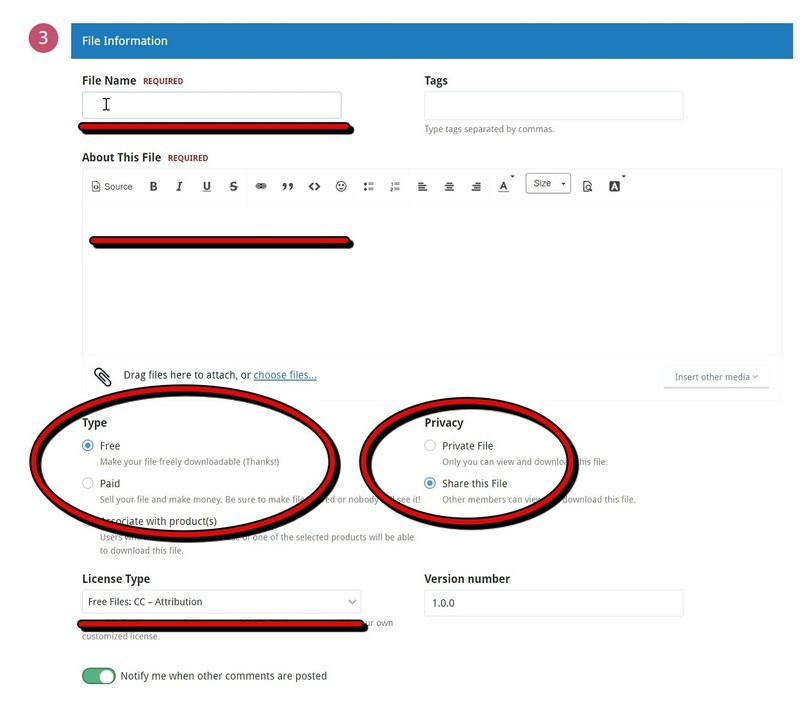 In Section 3 fill out a filename and a short description of your uploaded NRRD file. Specify whether you want the file to be private or shared, and whether this is a free file or a paid file that you wish to sell. You must choose a license type, although this is only really applicable if your file is shared as if it is private nobody will be able to download it. This portion of the form is shown in Figure 6. Figure 6: Filling out the submission form, part 1. Enter in information related to the uploaded NRRD file. Next proceed to section 4, the portion of the form related to the file you wish to generate. Make sure that democratiz3D processing is turned on and the slider shows green. Choose the appropriate operation. For creation of dental files, the best operation is "CT NRRD to Bone STL Detailed." This takes a CT scan in NRRD file format and converts it to a bone STL file using maximum detail. Leave the threshold at the default value of 150. Set quality to high. Make sure that you specify whether you want the file to be private or shared, and free versus paid. Make sure you specify file license. The steps are shown in Figure 7. Figure 7: Filling out the submission form, part 2. Enter in information related to the generated STL file. Figure 8: The file download page for your newly created dental model. Step 5: Check your dental STL file for errors and send it to your dental 3D printer! Once you have downloaded the STL file open it in Meshmixer. Meshmixer is a free 3D software program available from meshmixer.com that has many handy 3D printing related features. The democratized service is a good job of creating error-free files, but occasionally a few errors will sneak through, which can be easily fixed and Meshmixer. Click on the analysis button and then select Inspector as shown in Figure 9. Click on the Auto Repair All button and any minor defects that are remaining will be automatically fixed. Make sure to save your repaired and finalized 3D printable model by clicking on the menu File -> Export. You can now send your STL file to the 3D printer of your choice. Here is an example of the model when printed on a Form 1+ using white resin. You can see that the level of detail is very good. Formlabs has several examples of 3d printing teeth and other dental applications on their website. Thank you very much. I hope this tutorial was helpful. If you are not already a member, please consider joining the embodi3D community of medical 3D printing enthusiasts. If you have any questions or comments, please feel free to post them below.